So you have decided to jump aboard the handheld console bandwagon, and realized that you prefer to pick on the beefier PS Vita from Sony rather than Nintendo’s 3DS console. Having said that, a pair of decent headphones for the PS Vita (or the Nintendo 3DS for that matter) is important if you want to make the most out of it as the built-in speakers on the PS Vita are not going to cut the mustard for any self-respecting gamer. Hence, the Kama Stereo Headset from Mad Catz is here to save the day, where it delivers affordable quality, comfort and a level of unprecedented simplicity to PS4 and PS Vita owners. It will not skimp on quality despite carrying a $29.99 price tag, as the Kama Stereo Headset will boast of components derived from TRITTON’s premium headsets, where it will still be able to deliver an impressive audio performance. It has also been specially built for the PS4’s multiplayer online environments, letting you enjoy a comfortable audio experience while simplifying online chat. You can opt to hook it up to just about any device that has a 3.5mm jack, or connect it directly to the PlayStation 4 DUALSHOCK 4 Wireless Controller – it does not matter. 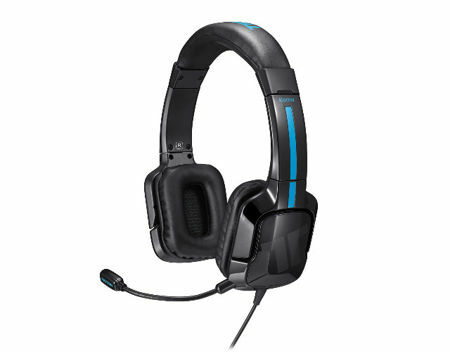 Not only that, Mad Catz has also thrown in a flexible performance microphone and uncomplicated inline audio controls to the Kama Stereo Headset that will further enhance your online gaming experience.